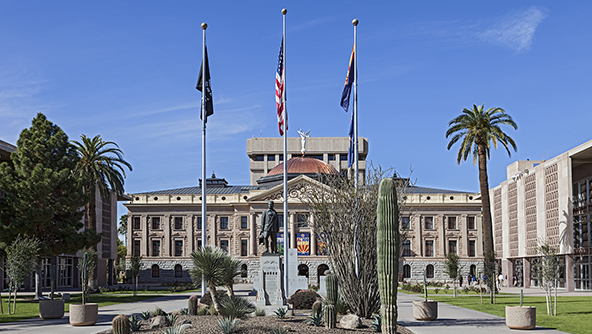 OSHA has repealed Arizona’s state-specific residential fall protection regulation put forth by the Arizona Division of Occupational Safety and Health (ADOSH) — Arizona’s state OSHA plan. Because of this change, Arizona homebuilders will now be required to implement fall protection for workers in construction activities at heights of 6 feet or more. The repealed standard had held that this protection was not required until workers were at heights of 15 feet or more. ADOSH originally instituted its more lenient fall protection requirements back in 2012. When challenged by OSHA, ADOSH representatives insisted that their standard was still as effective as the federal OSHA standard for keeping workers safe. As reported on this blog, OSHA responded that it was ready to take over safety standards from ADOSH if it believed minimum federal requirements were not being met. Between 2003 and 2014, 11 Arizona workers died in falls between 6 and 15 feet. Several officials, including Arizona senators John McCain and Jeff Flake, had requested that OSHA delay its ruling on this issue. However, so far, ADOSH does not appear inclined to fight the repeal. Last week, the Industrial Commission of Arizona released a statement holding that all Arizona employers will now be required to comply with the new fall protection standard. Citing Arizona’s capitulation, OSHA will allow ADOSH to keep its state plan status. OSHA’s engagement with ADOSH over this issue is important because it sets a precedent. Namely, that OSHA state plans must at least meet federal OSHA minimum safety requirements. If they don’t, federal OSHA has shown it is ready and willing to take action. Fall protection remains big on OSHA’s radar, ranking #1 on OSHA’s top 10 violations of 2014. Protecting employees from fall hazards can be especially important in situations where workers operate above chemical hazards; several recent news items illustrate the point. In late January, a maintenance worker in Alabama suffered severe burns to his face and internal organs upon falling into a vat of phosphoric and sulfuric acid. Last week, a brewery worker in California suffered serious injuries when he fell into a vat of hot mash. And on Friday, a worker in Des Moines, Iowa suffered injuries after falling into a tank of cleaning solution at a facility that produced pesticide enhancers. Currently, 21 states and Puerto Rico have OSHA-approved state plans that cover both private and public sector workers. Four additional states and the U.S. Virgin Islands have state plans for public sector workers only. Through its Federal Annual Monitoring Evaluation (FAME) procedure, OSHA annually evaluates each state plan to ensure it meets all mandated responsibilities and regulations. With nearly half of all American safety managers operating under the purview of state plans, it can be tempting for them to assume that they won’t be impacted by federal OSHA. However, as this case should make clear, keeping up with federal OSHA’s guidelines should be everybody’s business.